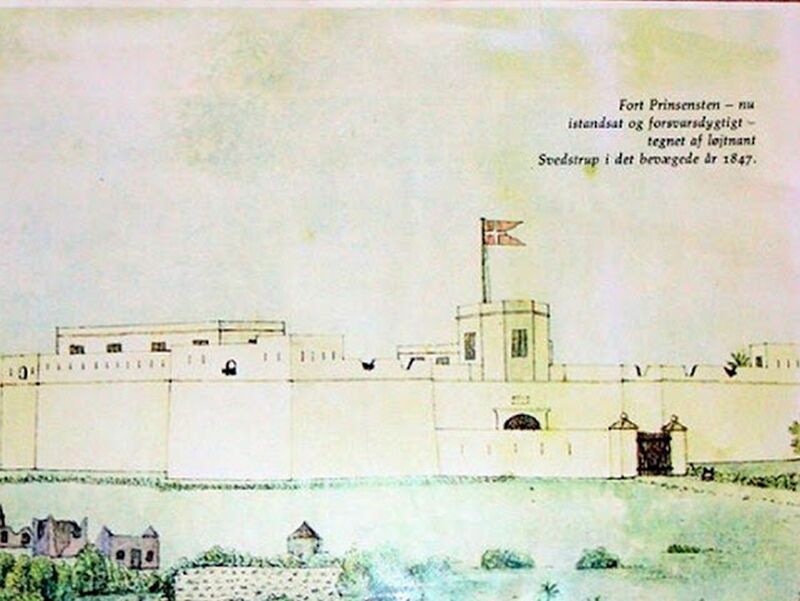 Fort Commandant Lieutenant Johan Vilhelm Svedstrup's painting of Prinsensten 1847. Excerpts from ‘ROUTES – The journey from Ghana to Svestrup’. The slave trade was not only an ugly business but it was also a deadly engagement for the merchants, officials and soldiers at the Danish forts. Very few returned home alive. Death was common during the first weeks of arrival at the Gold coast. Those who survived the first attack of the so-called climate-fever got a chance to serve some years on the coast, but sooner or later the fever caught up with them. The climate fever was a combination of African malaria, yellow fever, dysentery, heatstroke and Guinea-worm caused by diet consisting mainly of meat, drunkenness and too much Spanish pepper in the meal. On the bright side of life during the long absence from home were the dark-skinned good-looking local women. Wulff tells about a temporary marriage called Cassare. It was ‘temporary’ for the period of their stay on the Gold coast. The term was originally Portuguese. He called his African wife Sarah Malm and she inherited him when he died in 1842. Lieutenant Johan Vilhelm Svedstrup also had one, who looked after him and cured him with a local drug when he had an attack of the climate-fever. The relationship between them is described in depth by his son author Alexander Svedstrup in his novel Erik Gudmand. The slave trading and later abolition led frequently to conflicts with the Africans engaged in the trade. Danish Governor Jens Adolph Kiøge, who came to the coast in 1766, forced the Anlo king to swear loyalty to the Danish king. Kiøge extended the Danish territory westwards of Christiansborg castle at Osu in Accra, Ghana. The forts Kongensten at Ada and Prinsensten at Keta were built. Fort Prinsensten became the scene of one of the last dramatic events during the Danish period. It was when at the request of the then governor Edward Carstensen that Prinsensten which was abandoned and left in dis-repair was to be re-activated, in order to arrest people who continued to sell enslaved Africans to the Portuguese slave-traders. This was considered a violation of time-honoured rights, and excited the local inhabitants of the Keta village. They surrounded the fort and besieged it for several weeks. However, the commandant of Fort Prinsensten Lieutenant Svedstrup and his garrison of mulatto soldiers and fort personnel took a courageous stand until the naval brig “Ørnen” (the Eagle), under the command of captain Irminger, came to rescue the garrison and bombarded Keta from the seaside. In the beginning of 1845, the ageing mulatto sergeant Johan C. Hesse, caretaker of fort Prinsensten seized 45 enslaved male and 20 female Africans, who “belonged” to the infamous Portuguese slave trader Don Jose Mora. The next day Mora came to the fort accompanied by a large force of Anlo warriors and demanded to have the slaves returned. Lieutenant Johan Vilhelm Svedstrup who arrived at fort Prinsensten to fetch the liberated enslaved Africans tells about the events at the fort: “When Hesse declared that it was an insult to the Danish king, under whose flag they were standing, the Portuguese with a laughter went and took the flag down with the words: ‘Now you can see that the Danish flag is no hindrance, and if you want mine to hang instead, we can do that. If you do more trouble you can also be hanged there as well.’ “Then the slaves were chained together again and taken away, and the poor Hesse was left as a lost sheep”. The instruction about the repression of the slave-trade, under which both sergeant Hesse and Lieutenant Svedstrup were to act, had no effect on Jose Mora and his warriors. “The scandalous story was immediately reported to the General Custom and Trade Department in Copenhagen, which then gave an order to the restoration and re-occupation of Fort Prinsensten” Svedstrup recounts the events of the time, who himself was given the task to restore order. “On the 24th October I took off from Christiansborg (Osu) with 16 soldiers, and 20 workmen and their wives and children, so the caravan in all consisted of 50 persons”. After about 9 months Svedstrup and his workforce had to some extent rebuild the broken-down walls. But when the inhabitants in the nearby town Keta realised that the aim of the restoration was to stop the slave trade, the atmosphere got more and more hostile. On the 3rd of June the Anlos tried to kill Svedstrup. Prior to this dramatic event, a dispute had arisen about payment for the supply of lime to the fort for restoration work by some natives of Keta. Apparently, one of the suppliers from Keta was harassed by some fort personnel, and he subsequently lost his life. The battle continued over the next weeks around the fort Prinsensten. The Anlos made fire in some huts, hoping it would spread to the fortress. Instead the whole of Keta was burnt down. During an attempt to gather food, 7 of Svedstrup’s 16 soldiers were taken prisoner. Two of them were sacrificed to the local religious fetish shrine and their heads were put on sticks at a gunshot’s distance from the walls of the fort. The rest were sold as slaves. The situation was desperate then a French naval ship succeeded in landing some food and ammunition, but when it was used up, the garrison of the fort was left to make food of monkeys and rats. On the 10th October, after 3 months of the siege, by what seemed like divine intervention, the brig Ørnen, under the command of Lieutenant-captain Carl Irminger anchored at Fort Prinsensten. Hand grenades, a kind of machine-guns and rockets were landed at the fort. On the morning of the 16th of October, the brig bombarded Kedzi east of Prinsensten with grenades and bullets. Firing of the grenades made the coconut palms fall and smash the huts. That was too much for the attackers of the fort. On the 23rd of October, the Anlo chiefs asked for peace and promised to keep the prohibition against slave trading. ©Copyright. 2012 Nana Kojo Jantuah. All Rights Reserved.